Premier Notley announces private investment in a new petrochemical upgrading facility alongside David Chappell (r), Patrick Bergen and Pyramid Prefab Piping staff. The project would build on the company's supply and knowledge of propylene, a product it already produces at the company’s other petrochemical facilities east of Edmonton. Construction would create about 600 jobs with another 50 long-term positions supporting the local economy once the facility is fully up and running. Inter Pipeline’s supply of propylene, a gas that results from adding value to raw propane, creates the opportunity to further leverage Alberta’s natural resource strengths and extend the value chain. By producing acrylic acid used in things like adhesives, floor polishes and paints, this project increases the likelihood of attracting investments in more manufacturing facilities in the future. The announcement was made at Pyramid Prefab Piping, one of the hundreds of companies across the province benefiting from the Made-in-Alberta strategy. As a manufacturer that employs about 45 people in Calgary, Pyramid was contracted to build key components for Inter Pipeline’s project already under construction. Inter Pipeline’s acrylic acid and propylene derivatives facility would be in Alberta’s Industrial Heartland, northeast of Edmonton. Construction is expected to begin in 2021. Acrylic acid is a value-added product used to make coatings, adhesives, diapers, floor polishes and paints. Roughly 50 skilled, local permanent jobs and 600 skilled trade construction jobs would be created. Inter Pipeline has already been approved to receive up to $200 million in future royalty credits from the first round of the Petrochemicals Diversification Program for the construction its $3.5-billion Heartland Petrochemical Complex. Premier Notley’s government is investing $3 billion to support energy diversification that creates jobs and adds value to our resources here at home. The focus is on two key areas: partial upgrading of our bitumen and petrochemical processing that adds value to natural gas and natural gas liquids. 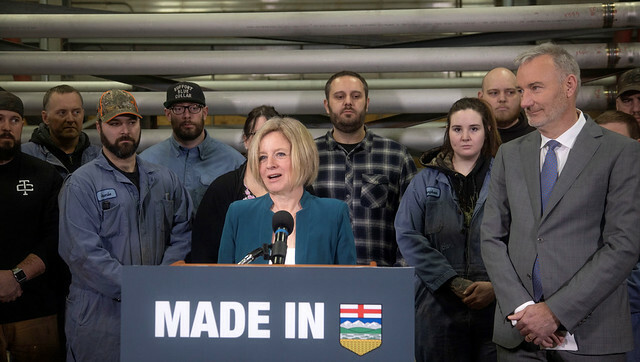 Overall, this commitment is expected to attract more than $25 billion in private-sector investment to Alberta and create more than 20,000 jobs. Support for the Inter Pipeline facility is provided under the petrochemical portion of the Made-in-Alberta strategy. Two projects – owned by the Canada-Kuwait Petrochemical Corporation and Inter Pipeline Ltd. – were selected under the first round of this program, which was announced in 2016. The projects combined for $8 billion in private investment, creating more than 5,000 jobs. The government announced a second round of support for petrochemical upgrading in 2018. Nauticol’s methanol facility was previously selected under the second round of this program. The entire project is a $2-billion private investment in a plant near Grande Prairie, creating roughly 3,000 direct and indirect jobs. $1 billion in grants and loan guarantees to encourage companies to invest in new or expanded bitumen-upgrading facilities.